TastyAsia | Comfort food, mostly Chinese. This dish brings several tasty flavors together: there’s mild bitterness from the kale, sweetness and some heat from the chiles, and salty umami from the soy sauce and the mushrooms. Ground pork adds some texture, but is optional. Kale belongs to the Brassicaceae family, also known as the crucifers or the cabbages. Kale itself is Brassica oleracea var. acephala, or in Chinese 甘蓝菜 (gānláncài). Brassica oleracea includes many other favorites as well, including broccoli and cauliflower (var. botrytis), cabbage (var. capitata), and Brussels sprouts (var. gemmifera). But never mind all that. Let’s just cook. My cousin Amy mentions that her garden is practically overflowing with fresh kale right now. For her benefit I’ll just point out that this recipe can go from garden to table in the time that it takes to make some rice. Heat your wok until barely smoking. Then add 1 Tbsp peanut oil and swirl it around. 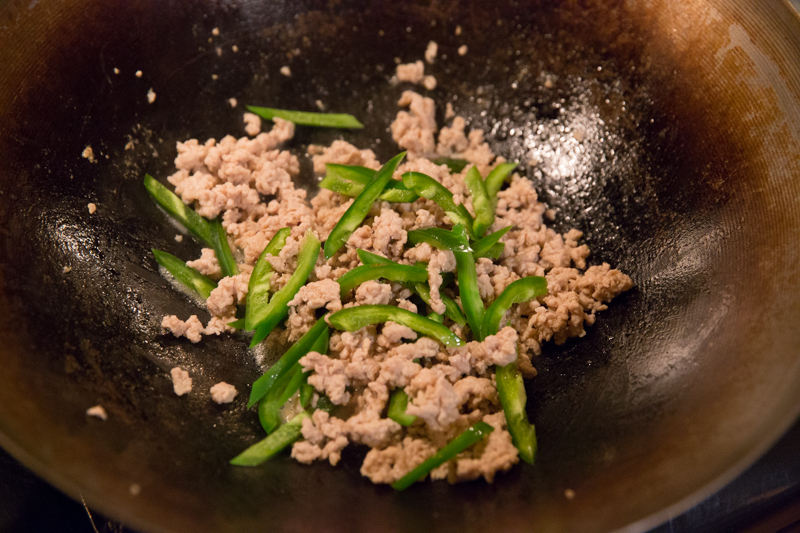 Add the ground pork (#1) and stir-fry until no longer pink. Toss in the chopped garlic (#2) and stir-fry for about 30 seconds. Then stir in the soy sauce (#3). When the liquid starts bubbling, add the kale (#4) and stir-fry for 5-8 minutes. The kale will wilt in 2-3 minutes, but keep on cooking it so that it gets tender. When the kale has softened, add the chiles, mushrooms, scallions, and basil (#5). Stir-fry for about another minute, then serve with rice and contrasting dishes. VARIATIONS: This dish is easily made vegan by just omitting the ground pork. The pork does deliver a bit of texture and protein though, so if you like, you can replace it with firm tofu crumbles or some other kind of vegetable protein. Thai cooks will see the basil and wish for fish sauce, so if that speaks to you, you can add 1-2 tsp fish sauce to #3 above. Feel free to vary the type and quantity of the chiles to achieve your desired level of taste and heat. If you use a chiles that are less sweet than Anaheims, you can add 1 tsp sugar to the soy sauce. This simple yet flavorful recipe comes via Thailand. A more traditional Thai version would substitute holy basil (Ocimum tenuiflorum) for sweet basil (Ocimum basilicum). The former has a more peppery taste, while the latter is perhaps a little more fragrant. Both work equally well; you can use whatever you have and still be confident that you’ll be making a very tasty dish. What makes this really work is the mingling of fresh aromatic basil, savory soy sauce and fish sauce, and the gentle acidity of the tomatoes, all supported by the protein of the stir-fried chicken. Start by chopping some fresh green chili peppers into slices. You’ll want to base your choice of pepper and quantity on the heat and flavor you’re looking for. Fresh Thai chiles (Capsicum annuum var. glabriusculum, also known as bird’s eye chiles) are a great choice, but are also famously quite hot. This is a matter of personal preference, so you’ll have to experiment to know what you like. Then with all the ingredients assembled and ready to go, you can fire up your wok and start cooking. Start by stir-frying the chicken until the pink color is gone. Then add the chiles. After the chiles turn bright green, add the rest in turns. Once everything is heated through, you’ll be ready to serve. Prep goes quickly and the total cooking time is about five minutes, making this yet another “simple” recipe by the TastyAsia definition, meaning of course that the whole thing can be done start-to-finish in the time it takes to cook your rice. Heat your wok until barely smoking. Then add 2 Tbsp peanut oil and swirl it around. Add the chicken (#1) and stir-fry until no longer pink, maybe 2 minutes. Add the chiles (#2) and stir fry until they turn bright green, perhaps 30 seconds. Add the tomatoes, garlic, and basil (#3) and stir fry gently until the basil just begins to wilt, perhaps a minute. Pour the sauces (#4) over the mixture and stir on high heat until the liquid begins to boil and thicken just a bit, maybe an additional minute or two. Serve with rice and contrasting dishes. Variations: As mentioned above, use can use either the more peppery Thai holy basil or sweet basil, and of course you can play with the chiles to get your desired level of heat. Ground pork substitutes easily for the ground chicken. And you can also add about 1/2 cup sliced mango for some sweetness and some additional color. Remember that in most Chinese recipes, you will vary the saltiness by varying the quantity of soy sauce.